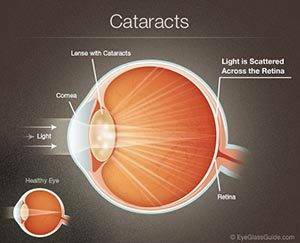 Cataracts are one of the leading causes of vision loss in people over 45. A condition that commonly develops as the eye ages, by the time we reach 80, more than half of us will have developed a cataract. A cataract is a clouding of the lens in your eye which is normally transparent. The lens, located inside the eye, behind the iris and the pupil, focuses light onto the retina at the back of your eye, where it is converted to nerve signals that are passed to the brain, allowing you to see. When your lens becomes cloudy, the images projected onto your retina become blurry and unfocused and therefore the signal to the brain is also unclear. You can compare this to looking through a dirty or cloudy window. If the window is not clear, you can’t see well. Usually, cataracts develop slowly over time so your vision gradually worsens. While the majority of cataracts are a result of the aging process, there are also congenital cataracts that are present at birth, secondary cataracts that result from eye surgery or diseases such as glaucoma or diabetes and traumatic cataracts that result at any age from an injury to the eye. While you may be able to live with mild or moderate cataracts, severe cataracts are treated with surgery. The procedure involves removing the clouded lens and replacing it with an intraocular lens (IOL) implant. Cataract surgery is a common procedure that has a very high success rate of restoring vision to patients. Modern cataract surgery is frequently done as an outpatient procedure. Patients will have greatly improved vision the next day and will continue to improve over the next few weeks. Surgery is often done in one eye first, and surgery on the second eye, if needed, may be done 2 weeks later. Signs & Symptoms of Cataracts Understand the warning signs and symptoms of cataracts to prevent them from affecting your daily life. Risk Factors of Cataracts Learn more about the risk factors associated with cataracts and what measures you can take to prevent or delay them. Treatment for Cataracts and Cataract Surgery Treatment options for living with cataracts. Learn more about cataract surgery and how to know if it is right for you. Intraocular Lenses (IOLs) If you are getting cataract surgery, there are a variety of IOLs to choose from including presbyopia-correcting IOLs, which can also correct for near vision loss associated with aging. Preventing Cataracts Additional information including lifestyle factors that could impact cataracts. Since they are largely a part of the natural aging process of the eye, cataracts can’t necessarily be avoided, however knowing if you have additional risk factors can help you to take preventative steps to delay the onset of the condition.